We have mangoes at False Bluff and in Virginia. The ones at False Bluff are "real" mangoes. The ones in Virginia are known as "hillbilly mangoes." By either name they're a treat. 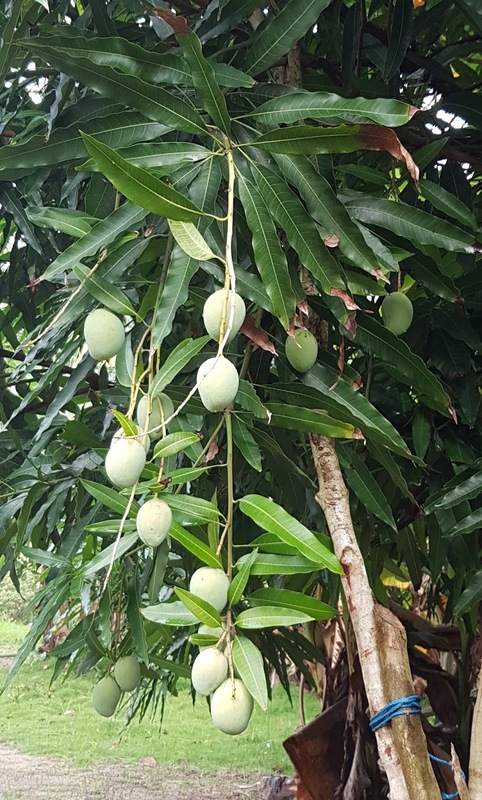 The mangoes in the first picture, mangifera indica, are not yet ripe and are on a young tree right outside our kitchen at False Bluff. This is the first year this particular mango tree has borne fruit and it's got a pretty good crop - enough of a crop to warrant propping up some of the branches. Below are asimina triloba, better known in the United States as Pawpaw but also known as the hillbilly mango. This tree is just one in a pawpaw patch near the James River and these pawpas, tho' green, are ripe. 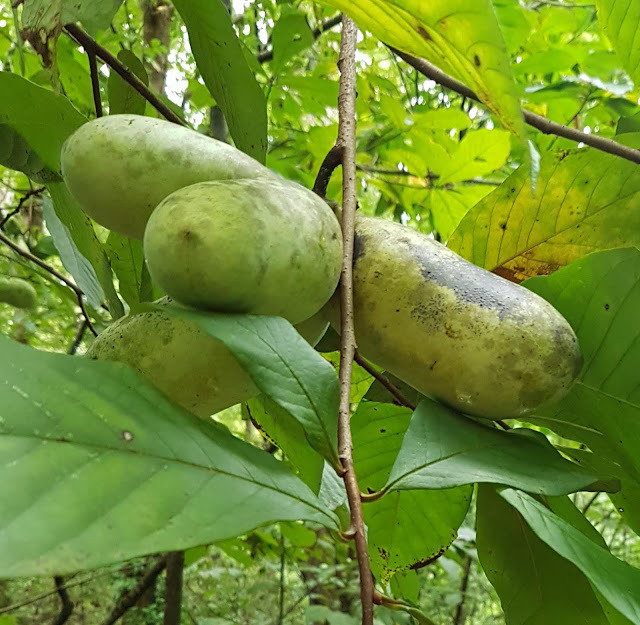 Some sources claim not only that the flavor of the pawpaw is tropical; but that the tree itself is a tropical tree that has somehow adapted to non-tropical climates: they extend all the way into Canada, a place not known for its tropical climate. Whereas the pawpaw thrives and sets fruit as an understory tree, our mangoes at False Bluff thrive under the hot Caribbean sun. It would be interesting to see how a pawpaw does in full sun.